The reason tbe Diet commssion says that it cannot be excluded that, even without a tsunami, there could have been a meltdown is because it suspects that the emergency generators could have been knocked off by the earthquake itself, especially for reactor 1. This has far reaching implications for the safety of the other plants. Then of course the flooding (originated by the tsunami) inflicted the generators a further final blow. Also, it was the earthquake that cut all external supplies of electric power and even power cables and eone electric panel inside Fukushima 1 that plainly collapsed. 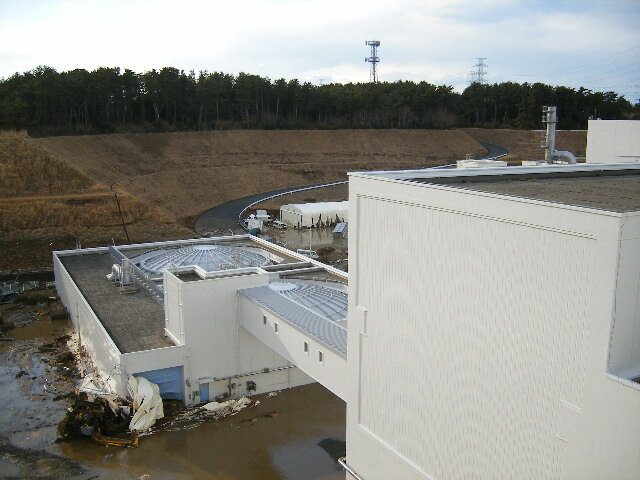 Also, April 7th quake severed all external power lines at Higashidori plant, which had to resort to emergency generators. However two out of three generators were offline for maintenance; had the third one failed to start it would have been a problem because batteries only last a few hours. Similarly for Onagawa npp: it survived April 7th quake using only its only available generator (the other diesel generator was offline to fix a seal that was installed the other way around, if I recall correctly). As far as I can see earthquakes often cause severe damages to npps electricity supply and plants barely survive the event. Way too close to Russian roulette. The panel suggested that some of the emergency generators at reactors 2 and 3 also might have been knocked out by the quake. 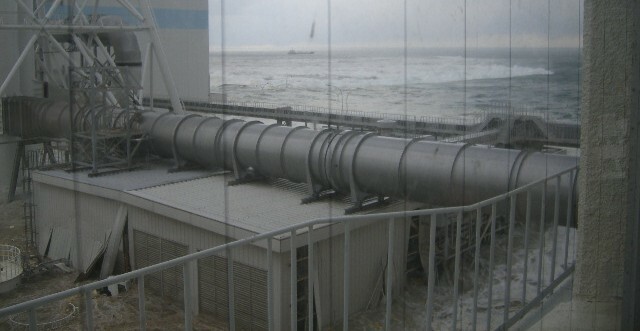 Tepco has consistently claimed that the initial tsunami that smashed into the power station at 3:35 p.m. on March 11 knocked out all the emergency generators, resulting in a total power outage. But the panel pointed out that a wave gauge set up about 1.5 km off Fukushima's coast recorded the first tsunami sweeping by at exactly 3:35 p.m., and estimated that it would have taken at least two more minutes for it to reach the No. 1 plant. This would mean that the power generators were knocked out sometime after 3:37 p.m. But it is believed the power generator in question was disabled between 3:35 p.m. and 3:36 p.m., implying the quake rather than the waves was responsible, according to the report. The ship inside the breakwater got out just in time they were very lucky to get clear. At 3:44:06 what looks to me like the generator building is flooded and the generators are gone. At that moment, anybody with knowledge of the systems knew that a meltdown was imminent within hours. It was revealed that the "battery backups" are not backups at all. They merely operate the instrumentation. That's like having a backup for the flight instruments of your airplane - you might know how fast you're going down and where you're going down, but the instruments can't keep you in the air if the engine fails. At that moment, the 100% focus should have been getting generators and pumps online as quickly as possible. No calling out to have somebody send them in. Call for the US military to airlift generators - They probably have a dozen of them within 100 km. They could have had some onsite and running in 3 hours. If that doesn't work, or even if it's in process,drive to a local farm, borrow, or steal a tractor or an off-road forklift (since the roads were broken up), Drive to the nearest cellular phone station, or factory - grab their back up generators and the fuel tanks and bring them back to the plant. Get an electrician to hook it up, and get them running immediately. Instead, they stayed on site and waited for help from outside. Help didn't even get started in their direction for nearly 24 hours. Ridiculous lack of assertiveness in dealing with this - unless the plants were already melting because the control rods didn't insert because of the earthquake. I remember screaming (in my blog) "Call the US military, get the chinock, airlift generators!" Instead, PM Kan and his officials sat while the generator trucks got stuck in the traffic mess after the quake. Battery backups are also useful to remotely operate valves. When Fukushima 1 lost the batteries too they had to climb into some awkward place using flashlights and operate valves manually (valves were not designed to be easily operated by hand). 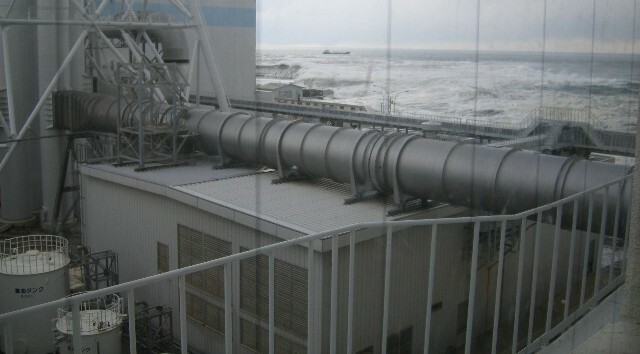 Also, Fukushima 1 had a system to use the steam produced by the stopped reactor to operate the reactor cooling pump; this safety net did not work either (can't remember why, some valve problem?). pffft ... all harmless photos. there are photos, where the 50 meter high reactor buildings look like a 2x2 lego block on a regular beach surf. @ anonymous at 5:34 PM, just please give a link to these photos. I agree with you, TEPCO downplays all the time. Wasn't there something with the water intake pumps at the ocean also having been destroyed or washed away? In which case, even working generators wouldn't have been much good? As Gunderson and others have pointed out, the emergency generators were doomed because the SERVICE WATER PUMPS, which provide cooling to the emergency diesel generators, were located almost at sea level. The tsunami washed those pumps away. From that point, the fate of the plant was sealed. I have not seen any recognition of this problem in regard to restarting Oi or other plants. It is a serious oversight. Placement of the diesels (in waterproof basements or on high ground) is irrelevant as long as they depend on sea level pumps for cooling. I believe Arnie Gundersen mentioned that at Fukushima 2 the pumps were a newer model and therefore survived the tsunami. Tepco knew Fukushima 1 pumps were more vulnerable yet did not replace them. Ditto for the electric board that collapsed because of the earthquake. Amazing how much Tepco could have done but didn't, so much that it becomes hard to determine what was the decisive fault. The release of these pictures is a diversion by Tepco, it means they have something bigger to hide. They've never released anything unless it was to obscure other problems. Now my question is Asahi sent a chopper over Unit 4, where are the other pictures? What other damage is going on at Fukushima?